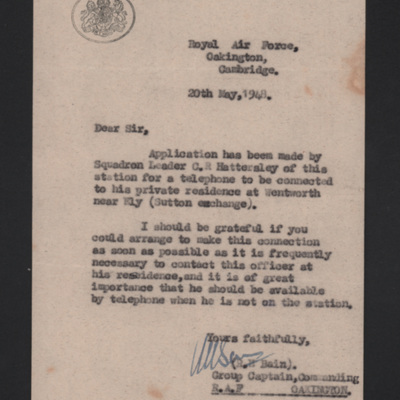 Letter from Corporal F W Meredith, Squadron Leader Wilson's batman, expressing sympathy and stating that he had been ask to forward a number of articles and he would do this under separate cover. Offers hope that her husband was taken prisoner. 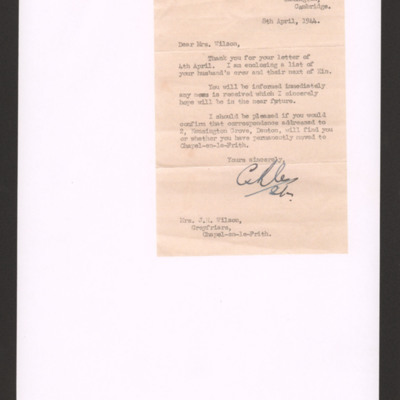 Letter from the Chaplain at Royal Air Force Oakington to Mrs Wilson expressing his sympathy that her husband and his crew did not return from an operation to Nuremberg the previous evening. 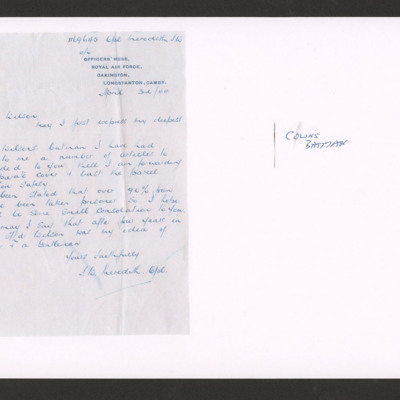 The letter is in support of Peter Hattersley's request for a telephone line to be installed at his house. 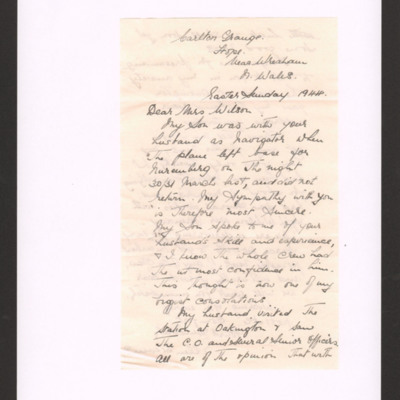 A duplicate book with letters handwritten by Peter Hattersley to various people and organisations. A group of aircrew and one ground crew member arranged at the rear starboard side of Lancaster PA964. Six are standing and three are sitting on the tail plane. 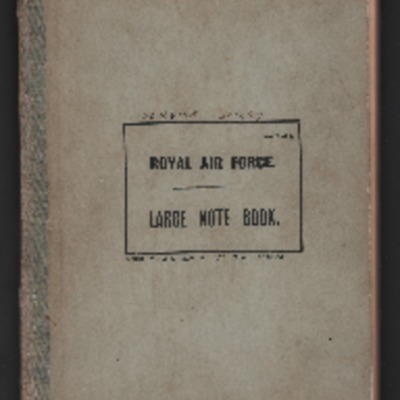 One the reverse it is captioned with the names of the aircrew. Five aircrew sitting on the starboard inner engine of Lancaster PA964, MG-K, one sitting in the cockpit and two including Tom Jones are sitting at the back of the cockpit. The individuals are named on the reverse. 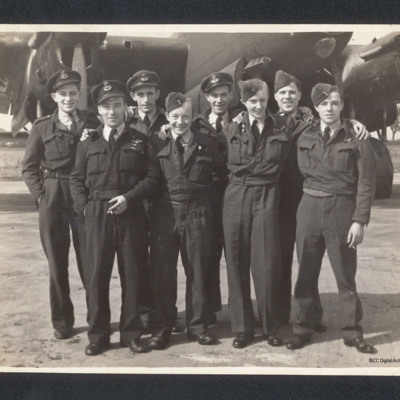 Eight aircrew, including Tom Jones, standing at the starboard side front of a Lancaster, PA964. On the reverse the aircrew are identified. 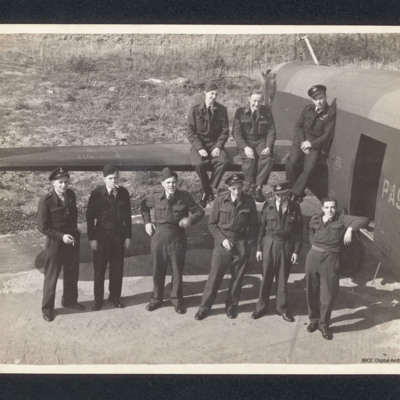 Eight aircrew, including Tom Jones, standing in front of Lancaster, PA964, 'MG-K'. On the reverse the individual members are identified. A group of eight airmen standing at the nose of a Lancaster. On the reverse are the names of the aircrew. 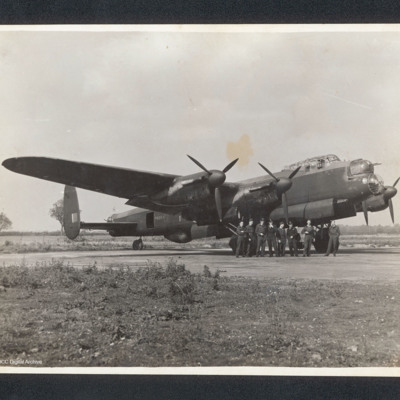 A starboard side view of a Lancaster, PA964, on the ground. There are eight aircrew standing at the nose. 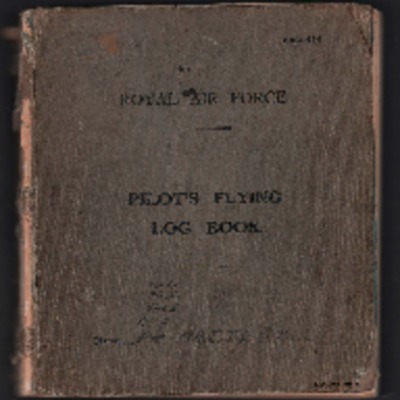 On the reverse is a list of the aircrew including Tom Jones and a list of his operations. 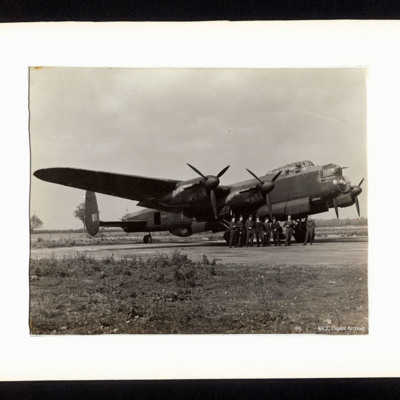 627 Squadron was formed in November 1943 as part of 6 Group Bomber Command. 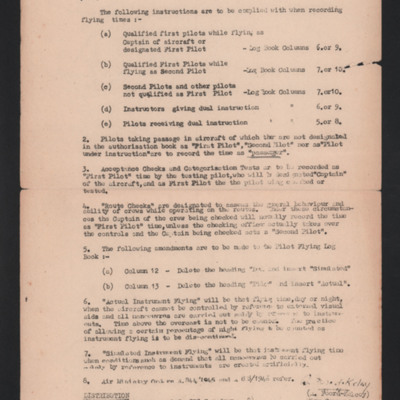 In April 1944 it was transferred to 5 Group as its Pathfinder squadron. It disbanded in September 1945. It was stationed at: RAF Oakington and RAF Woodhall Spa.